Let’s get to know Yvonne! I live in Tehachapi, California, which is a small town in the foothills of the Sierra Nevada Mountains and about an hour east of Bakersfield. 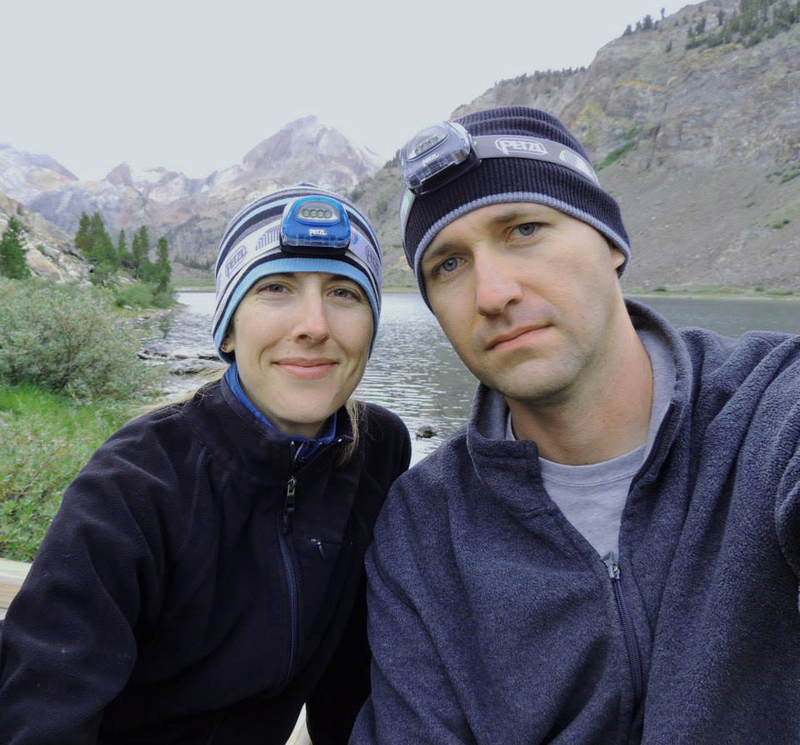 My husband and I settled here 10 years ago when we moved across the country from Virginia to take jobs in the aerospace industry working in Mojave. We love the small town and it is rare to go out on an errand around town and not see someone we know. We can’t plan to just go for a quick trip to the local hardware store because we inevitably end up visiting with friends longer than intended! I love to travel with my husband, Michael. Some of our favorite places to visit nearby are Death Valley, hiking in the upper Sierras, and visiting the California coast. 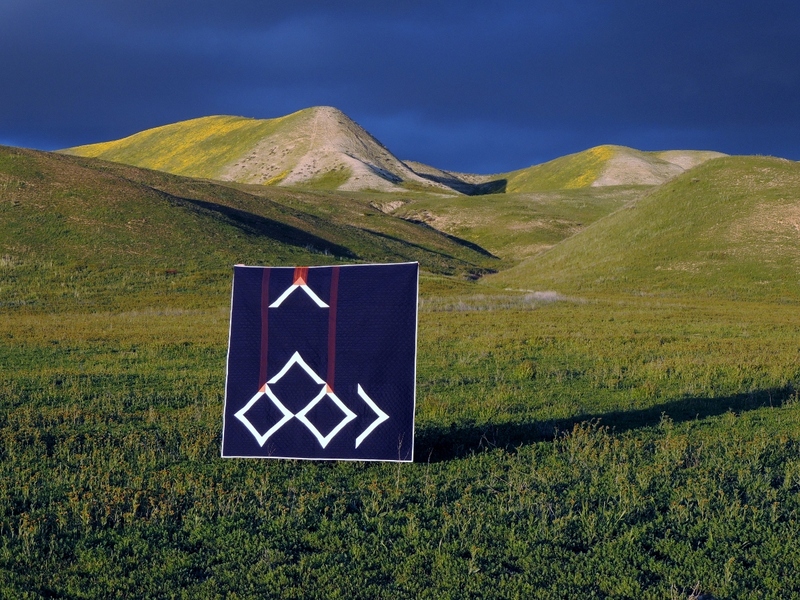 I don’t know that I can pinpoint the first time a saw a quilt as they were just a staple around as I was growing up. 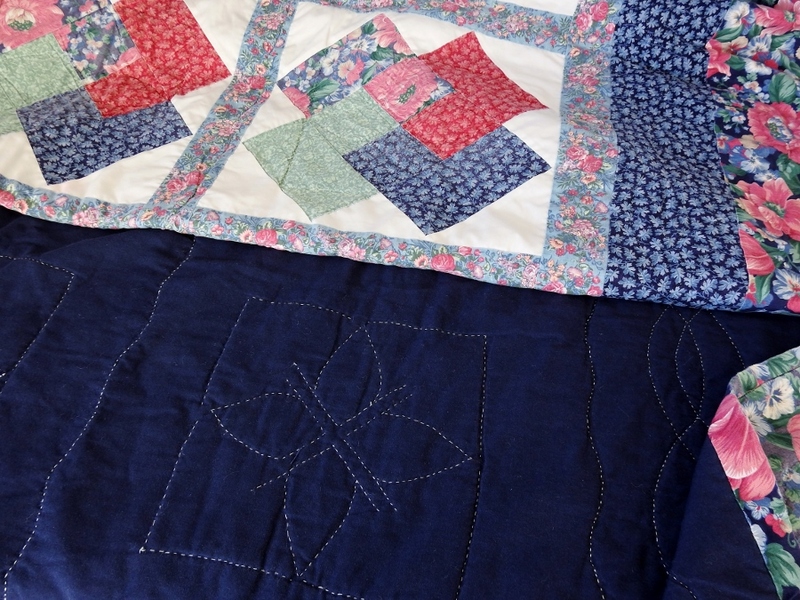 My mom made and tied two quilts that my brother and I used to create indoor “forts” as kids, and my paternal grandmother was a prolific hand quilter. 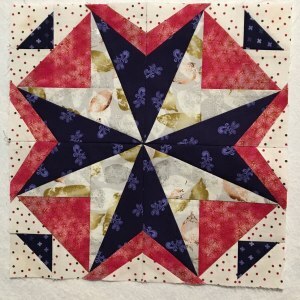 My paternal grandmother encouraged me to begin quilting when I was in high school by offering to hand quilt a twin sized quilt that I could take to use in my college dorm room. 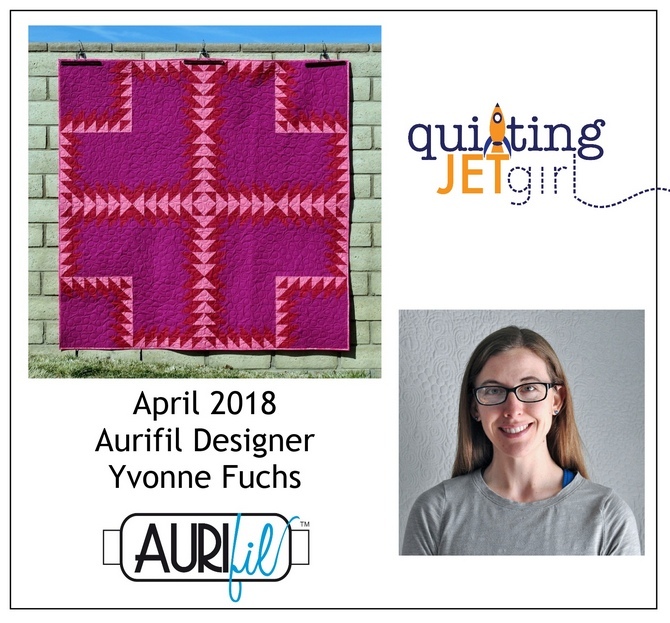 I took her up on that offer and I loved using the quilt we created together. 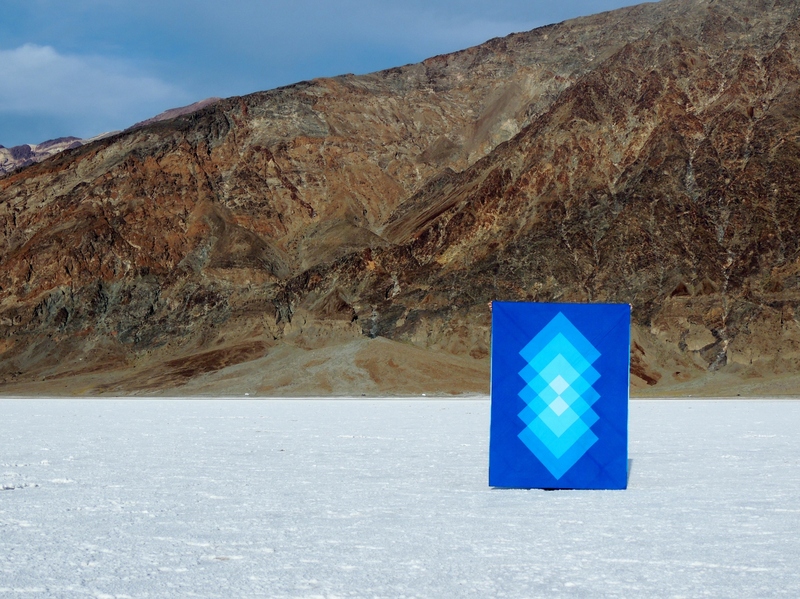 I enjoyed creating that quilt so much that I quickly went on to make many others, and I haven’t looked back. 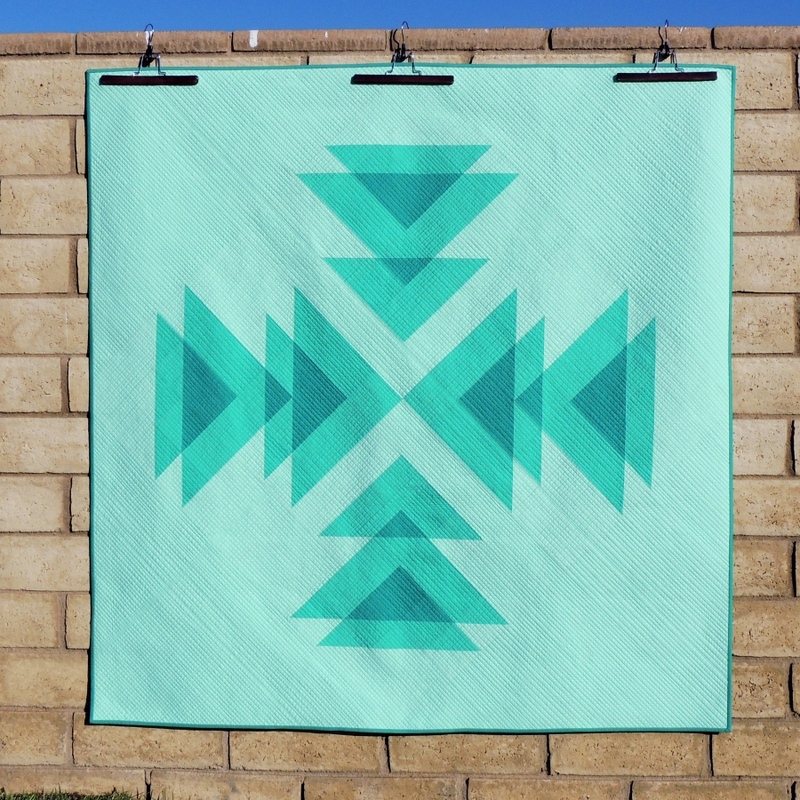 We couldn’t have known at the time, but my first quilt was the last quilt my grandmother quilted before she passed away, so it is definitely a quilt that I treasure. Recently, I slept underneath one of my grandmother’s quilts when I was home visiting my parents. It was a delight to get to spend time looking at her work. I usually hand stitch my bindings to finish, but I have been working to learn how to create nicely finished machine binding lately. A real key change for me in machine binding was using a glue stick to baste the finished edge of the binding down before the final top stitching. This has helped me keep a much more even finish in the binding. I have the full use of a room at the front of our house just off the living room to use as a studio. The room itself is billed on the floor plan as an ‘optional 4th bedroom’, so there is a nook along one wall where a closet could be installed that my husband and I built a sewing table into. I also keep all my stash in the shelves and bins above my sewing table. 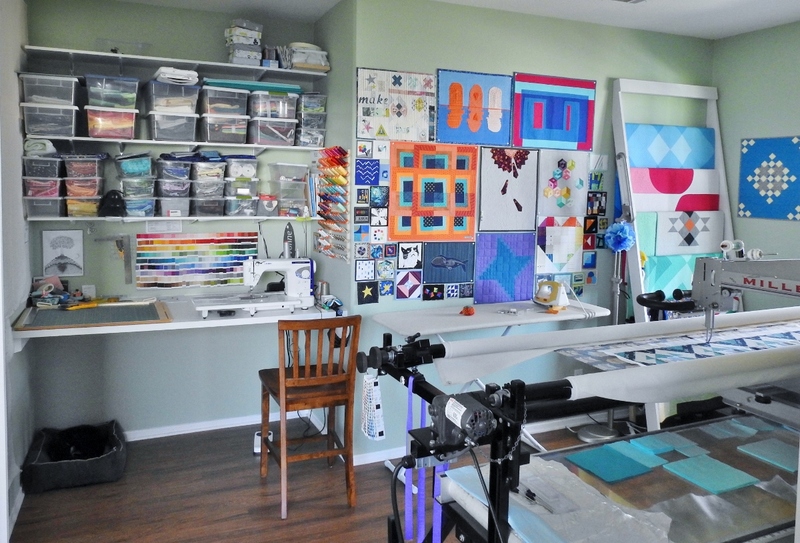 As you can see in the photos, most of my space is taken up by a longarm machine, which I purchased used 3 years ago. 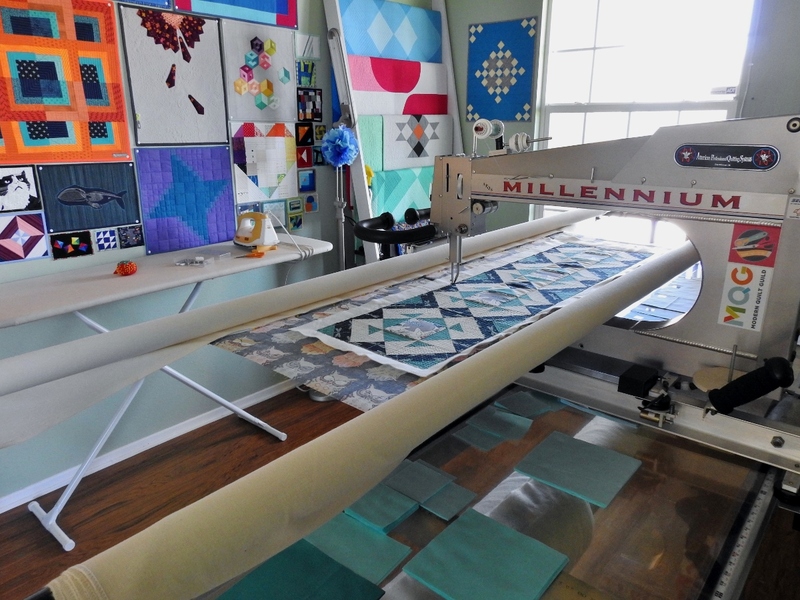 It is a 2004 APQS Millennium on a 10 foot frame, and I tend to use the leader bars and the pantograph table to hold projects waiting for my attention. I don’t know that there is much I would change about my studio, but my design wall could use a refresh for sure, and a fresh coat of white paint would change things up a bit, too. 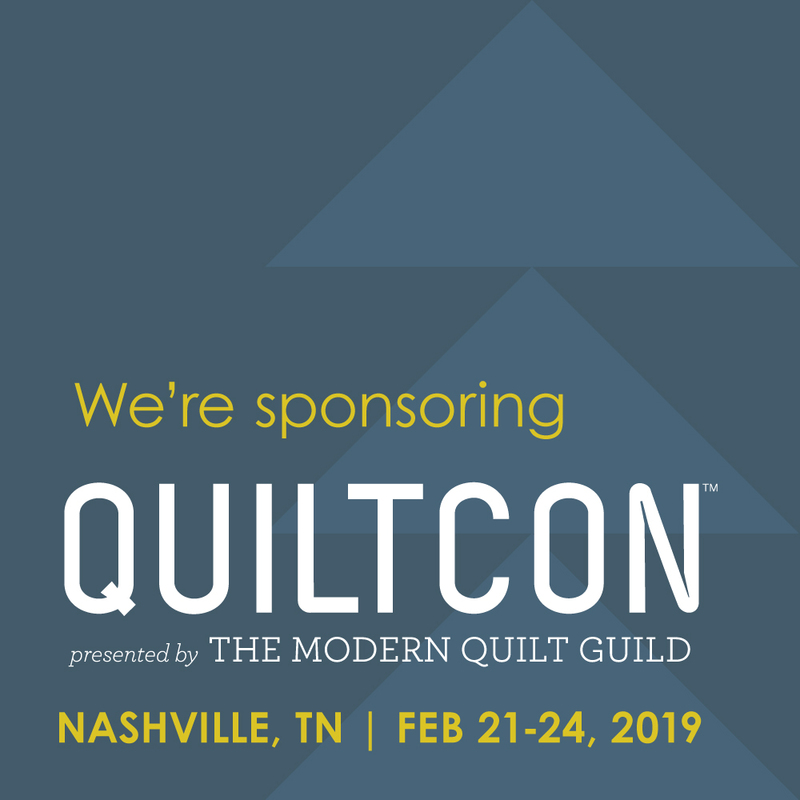 I will be teaching at the Valley Modern Quilt Guild in June, and I am working to expand the classes and lectures I have available for guilds, shops, and retreats. 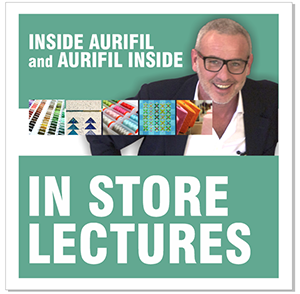 I also have lots of behind the scenes work going on at the moment: I am re-vamping my wesbsite, I have several upcoming projects in magazines, I am part of the Pattern Drop design team for 2018, and I am also on the OLFA design team this year! Keep an eye out for lots more fun projects from me throughout the year. As I mentioned earlier, I love to travel with my husband. One of our favorite drives is along the Pacific Ocean on California State Route 1, and if we won the lottery, we would love to move to Pacific Grove. 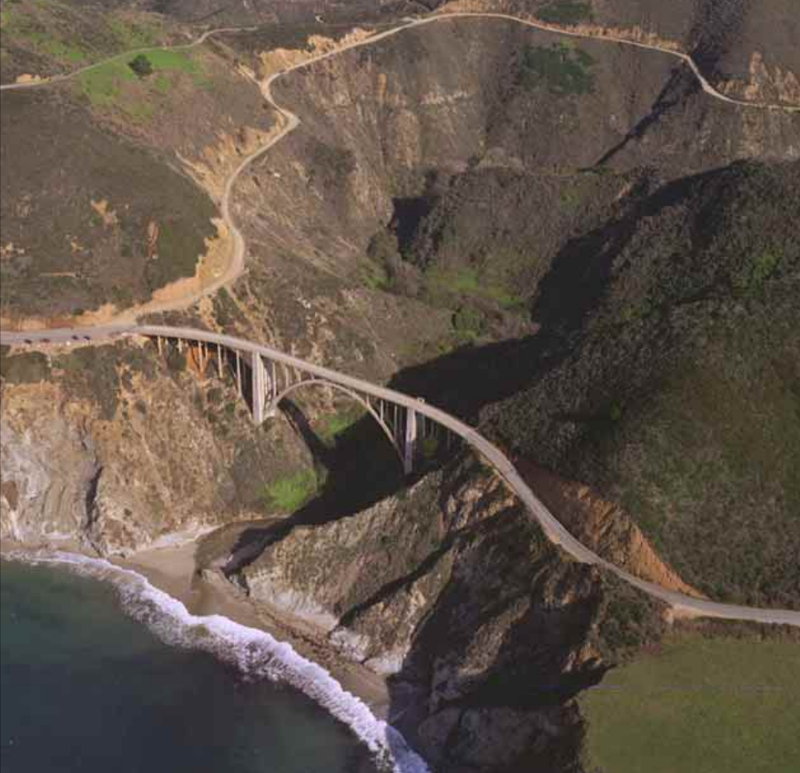 There are many beautiful sites, vistas, and historic bridges along SR1, but the Bixby Bridge indicates the transition away from the Big Sur area of the coast and onto the Monterey Peninsula. 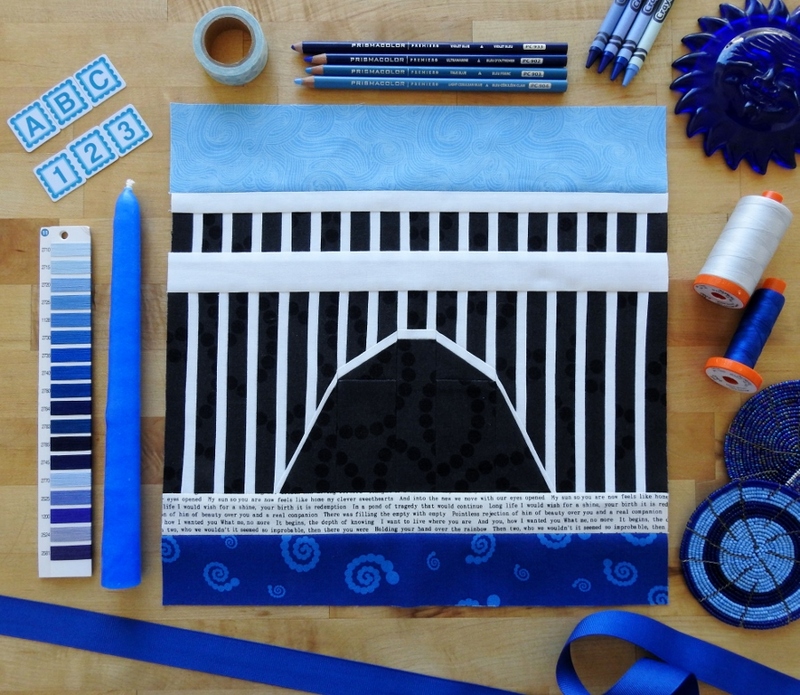 In researching the Bixby Bridge to create this block design, I learned that it is one of the most photographed bridges in California, and it is one of the tallest single-span concrete bridges in the world. 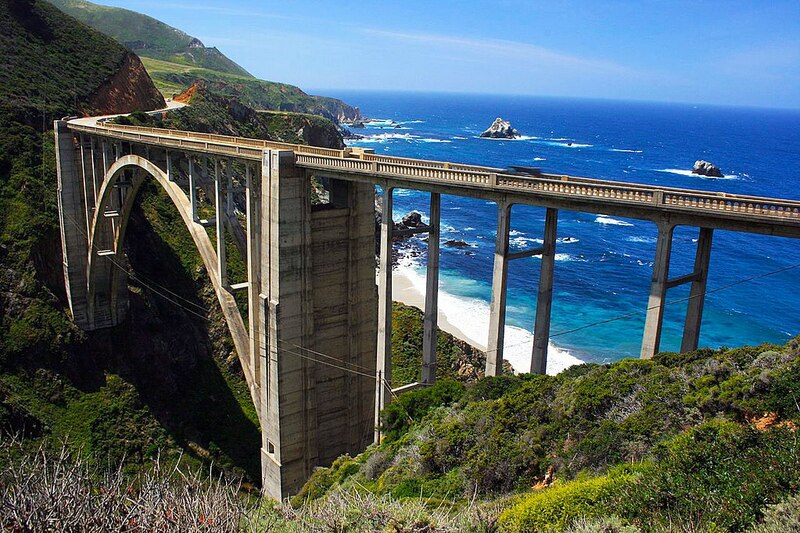 The bridge was completed in 1932, and the opening of the bridge connected residents of the Big Sur area who were often cut off during winter. What makes the Bixby Bridge so beautiful, in my mind, is the way it seems to connect land, sky and ocean. I look forward to seeing all the versions of the block that will be made! 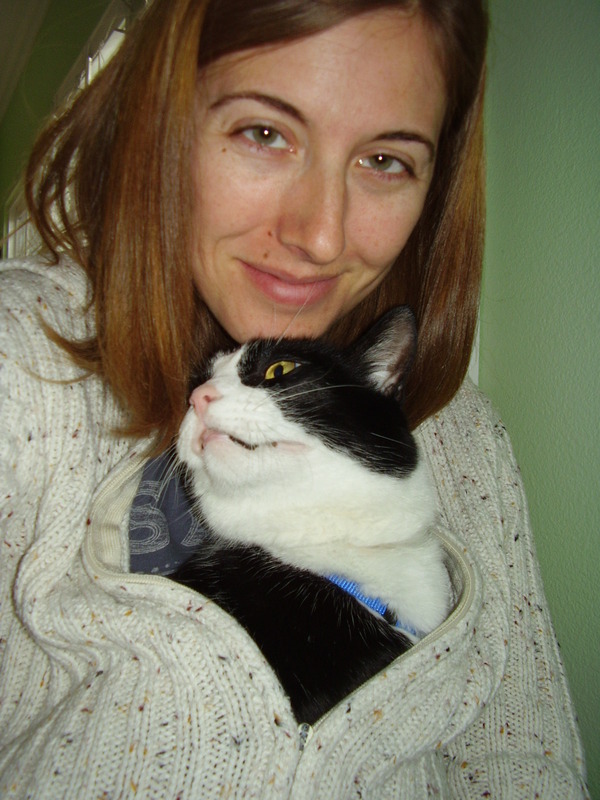 I am a Cat person. 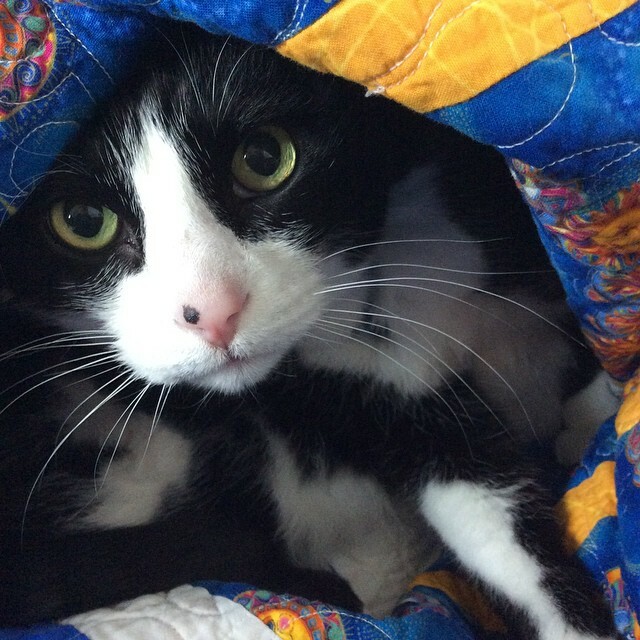 My buddy is a black and white tuxedo cat named Puppy, and he was named by husband (boyfriend at the time), who is clearly a dog person! Puppy just turned 16 years old and will likely be the last pet we have, at least for a while: my husband is allergic to cats and I’m allergic to dogs. Puppy loves to be curled up in my lap when I am working at my desk, sleeping on a mini quilt made just for him, or under my sewing table. He’s usually the first to get to the front door when the doorbell rings. If you could eat only 3 foods for the rest of your life, what would they be? Avocado, cheese, and corn chips. 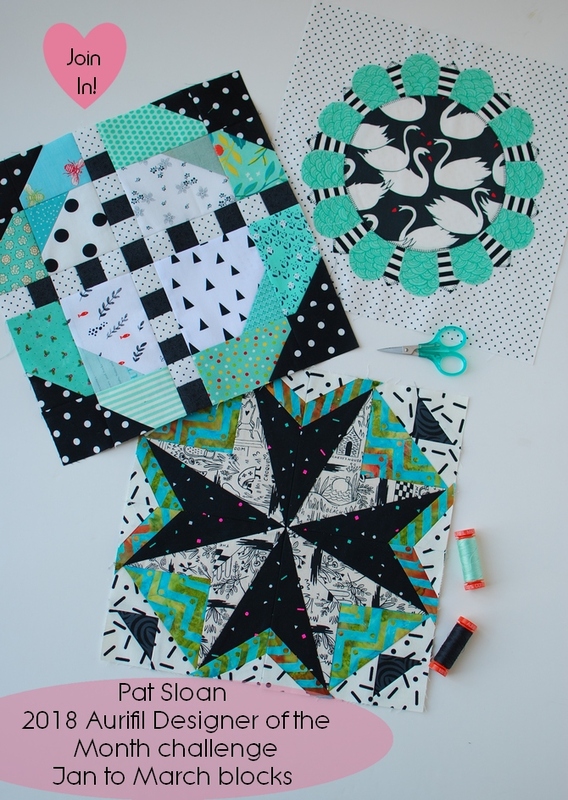 I need HELP deciding on the fabric for my block..
CLICK TO MY Website and give me your opinion!